Already putting up a strong front. H ow disillusioned are you when it comes to mobile and free to play gaming tends to directly correlate with how abusive the games you’ve played have been. “Free to pay” gaming has been rightly lambasted by both core and casual gamers as cynical attempts to dip into players wallets. Dungeon Defenders was a cute take on Tower Defence and RPG genre way back in 2010, taking the tongue right through the cheek as some pint sized protectors fought for their lands. The kids have grown in the interim years, and the young men and women have returned to the sequel. 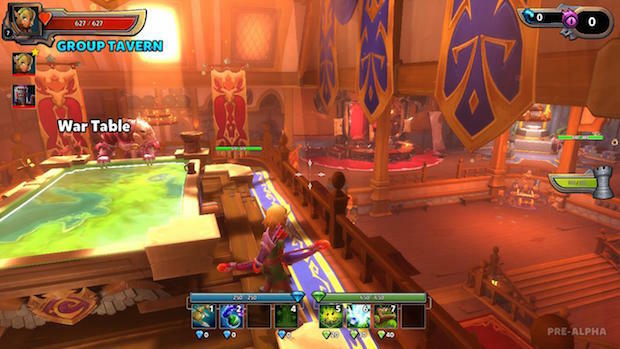 In our time with Dungeon Defenders II, micro transactions have yet to be incorporated into the game, leaving the mechanics to properly carry everything. 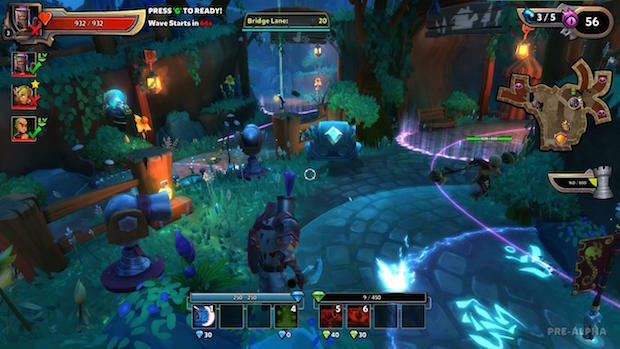 Luckily, Dungeon Defenders II doesn’t seem to suffer from lazy design, at least so far. Assuming the micro transactions remain limited to things you can earn in game, it’s already doing great.
" 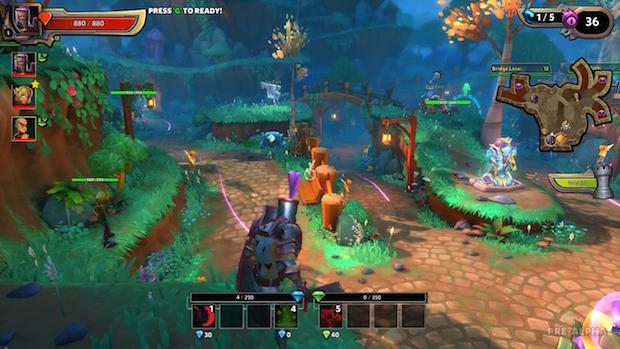 The good news is that the structure doesn’t seem to suffer from the lack of microtransactions, dodging the immediate question of wether or not Dungeon Defenders II is following a lazy pay to win model. " The good news is that the structure doesn’t seem to suffer from the lack of microtransactions, dodging the immediate question of wether or not Dungeon Defenders II is following a lazy pay to win model. The simplistic tower defence variation gameplay definitely helps it along by keeping things simple. Between four classes (at least in our build) and four players, groups work together to defend a cart in the back of whatever small arena they happen to have been placed in. Enemies will approach from several set paths, and players strive to set traps, erect defences (not to mention offences) and get their hands a bit dirty themselves as they survive the mounting waves of foes. The rub is the barter system mechanics, where spells and structure building are both tied to separate in-game gem currencies as opposed to a typical mana bar. The resource juggling game this creates can leave a team scrambling to cover zones when they don’t communicate properly, or creatively finding ways to mix defences and coordinate attacks based on who has the scratch.
" There are allegedly many more heroes to come in the final version, suggesting everybody is going to find their fit with enough time. " The classes don’t just differ in play style and range either. Each class brings their own type of defensive and offensive structures to the table as well, encouraging class differentiation among team members. While the elven huntress might bring stalling geysers and tricky mines to the table, the undershirt clad Squire packs serious heat with cannons. Every class has a role to play. The Squire being the front lines fighter class puts himself in the thick of things and handles the chaos admirably. He doesn’t have much in the way of range himself, but through building cannons and barricades, is invaluable to commanding the flow of a battle. The Monk plays a role reminiscent of a cleric from a standard RPG, with minimal range tactics and a glass defence. His towers though can heal fellow defenders, and buff any towers in their range. While the Monk’s time is better spent in a support role, the Apprentice is the box standard mage in almost every sense. Magical barriers and status effects are his game, beating back the advancing forces through his tricks.
" The ingredients are there for an excellent time killing, if not terribly deep, team defence game. " I spent most of my time with the Huntress, enjoying the tactile approach to combat while affording the ability to keep my distance. Her mines and enemy stalling geyser traps slow the advancing troop to get picked off from a high perch where she can take potshots at several lanes at a time. She’s a technical kind of fighter, and it fit right into my play style. There are allegedly many more heroes to come in the final version, suggesting everybody is going to find their fit with enough time. Finally, even in pre-alpha the presentation has itself more together than most full releases. The visuals aren’t the sharpest ever, resembling Kameo ever so slightly. Though the clean art style does keep the framerate consistent, even on weaker machines. The online play ran with minimal stuttering too, though the jumping around when the server is busy can get annoying. Dungeon Defenders II is coming along tremendously well, and seems to be mostly working on mechanics, characters and monitization. The ingredients are there for an excellent time killing, if not terribly deep, team defence game. Assuming the microtransactions don’t turn abusive it’s going to be a title to watch. This game was previewed on the PC.